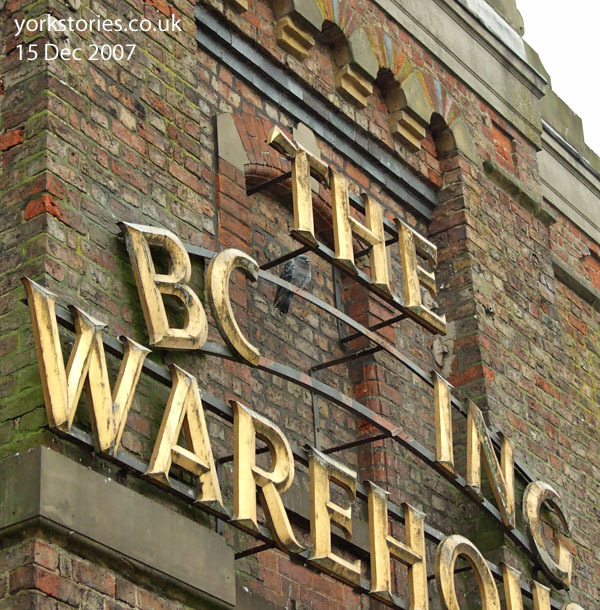 So here it is, in June 2007, displaying a ‘Sold’ sign. This obviously seemed significant enough to take photos of, but it’s only very recently that I’ve realised – seeing the redevelopment work, the private bridge being constructed to the expensive apartments – just how significant. I said it had been ‘ours’. I meant ours in the sense of being a venue we loved, back in the 1990s. A place I spent many memorable happy times. More on that story later. But of course it was ‘ours’ in a bigger sense. It was, for all its former life, until this sign appeared, a council-owned building, built for the local authority and still owned by the council (and occupied by leaseholders). If it’s a council asset then it belongs to ‘the city’, to us. All that ended, inevitably, probably. 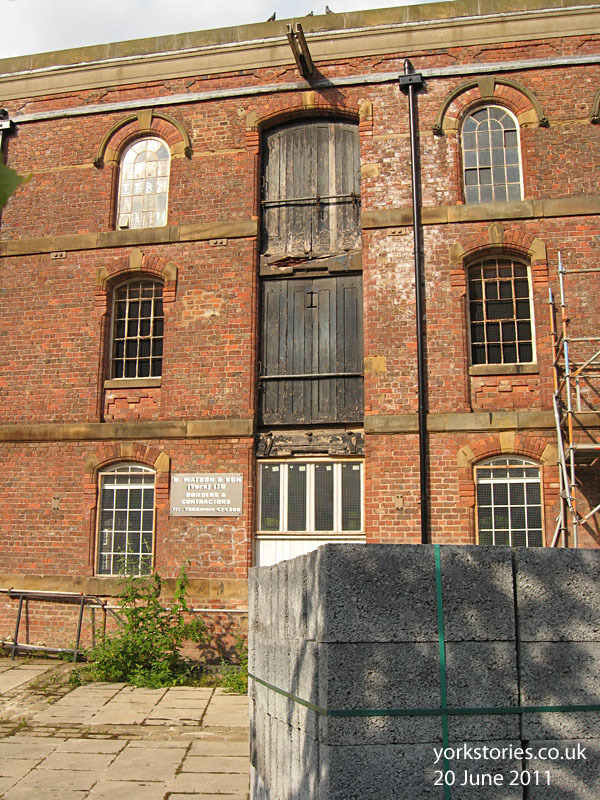 It’s a difficult building, because of the flooding problems and because it’s a listed building. It clearly needed a massive investment to make it flood proof and to repair the years of neglect, and so the only way to finance that is to turn it into expensive, exclusive accommodation, I guess. There may be, later, a restaurant on the ground floor. So some of us may be able to afford a meal there. But some of us know what we’ve lost. As the next picture, from 2007, shows. It’s one of my favourite images from the ten years this site has been online. Private, exclusive, expensive … What else could you be? 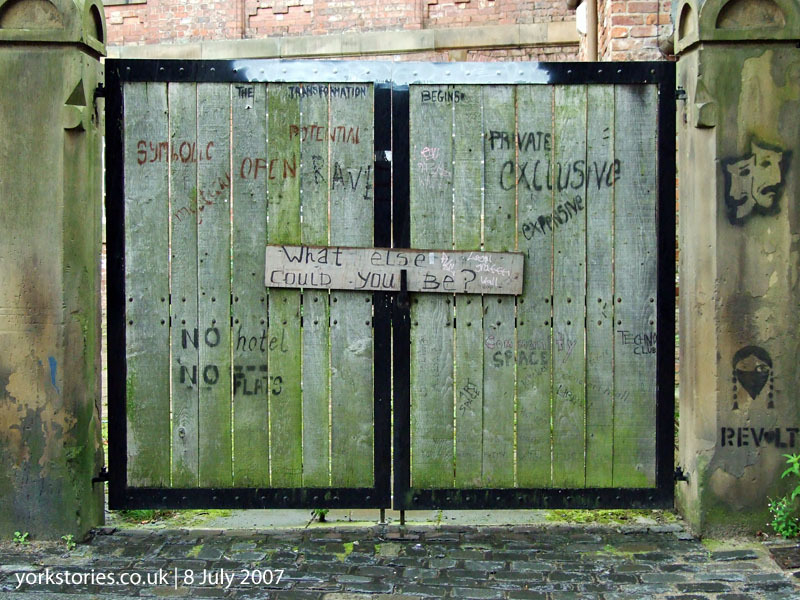 The gates facing Skeldergate decorated with thought-provoking graffiti, in the summer of 2007. I wrote about this earlier. And saw it fade, later. Those gates will be gone now. Iron security gates will probably replace them. Several people had been keen to get their hands on this building and it all got a bit heated. Local businessman Marti Dix and beggar-hating entrepreneur David Hattersley had a ‘war of words’ in the pages of the Press, flinging around phrases like ‘yuppie playpen’ and ‘old hippy rubbish’. 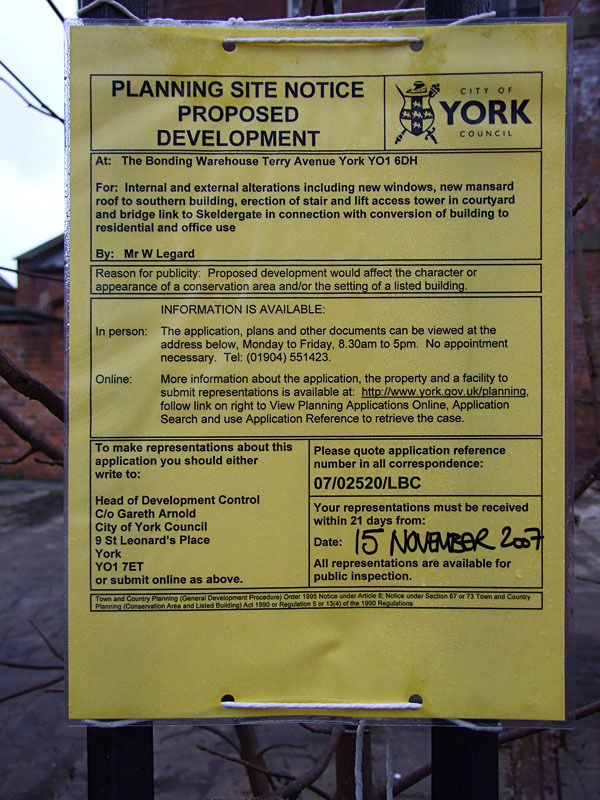 In the end, it was sold to William Legard, and his planning application was submitted in November 2007. More letters lost from the once proud signage on the end of the building, but the pigeons didn’t care, and perched on it as they had for years. Work began. Materials and scaffolding filled the yard. On the walls were signs advertising the involvement of Watson & Son, a long-established local firm, in the building work. 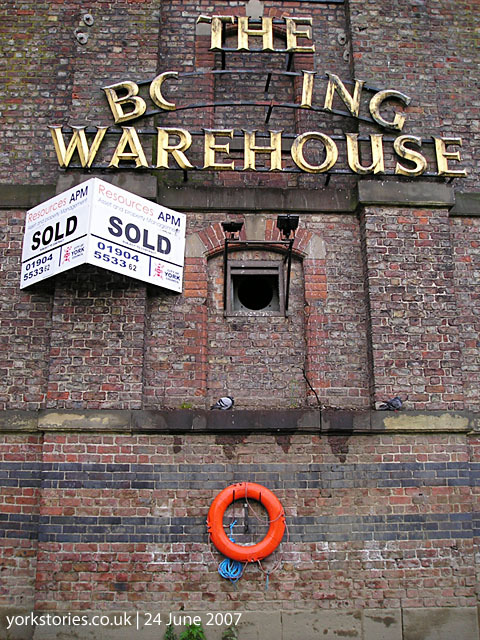 The Press reported, on 2 June 2011, that the scheme had collapsed, and that the Bonding Warehouse had been repossessed. Which is why I revisited to take yet more photos. Watson & Son also went out of business, so I understand, as a result of the collapse of this redevelopment scheme. 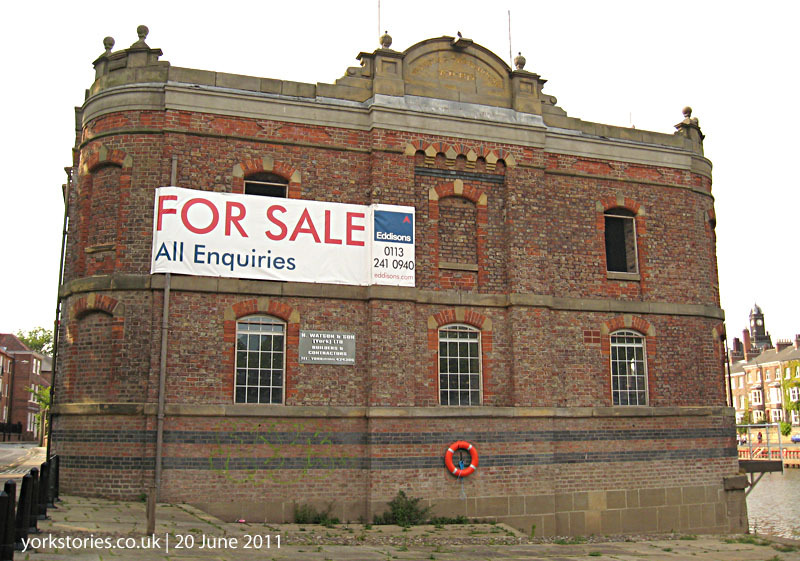 So here we are again, with the Bonding Warehouse ‘For Sale’ again, in 2011. 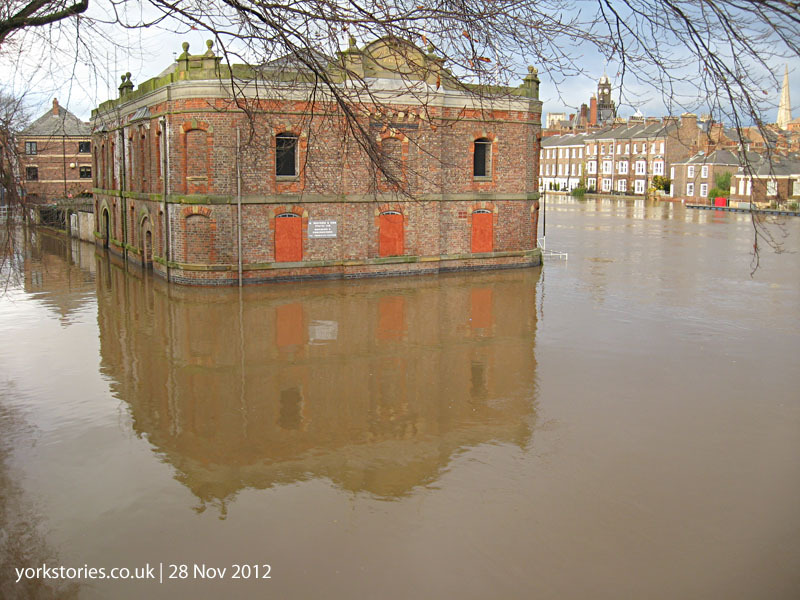 And here we are again, with the building surrounded by flood water, in the autumn of 2012. 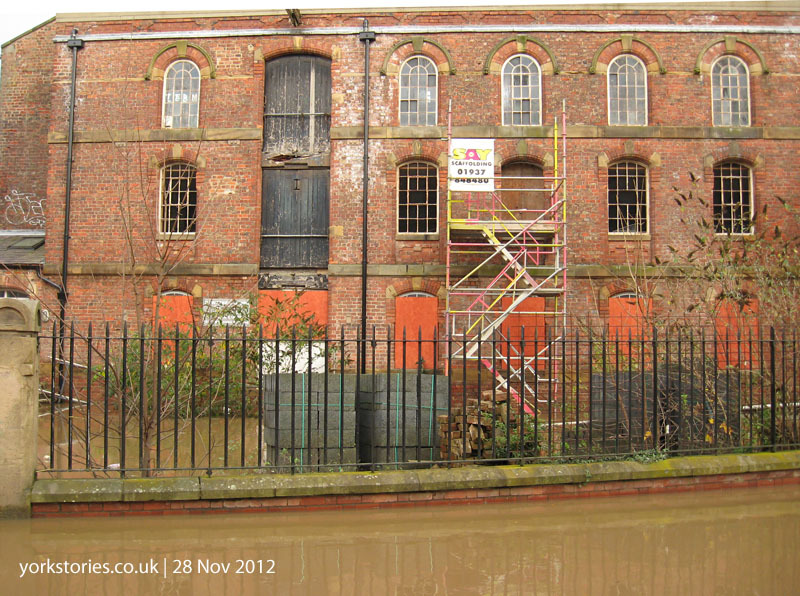 A reminder of the floods of twelve years earlier which had led to its closure. The Watson & Son sign is still there, a little reminder of recent history. Handsome place, still, isn’t it, even after all the neglect, and the half-done redevelopment. 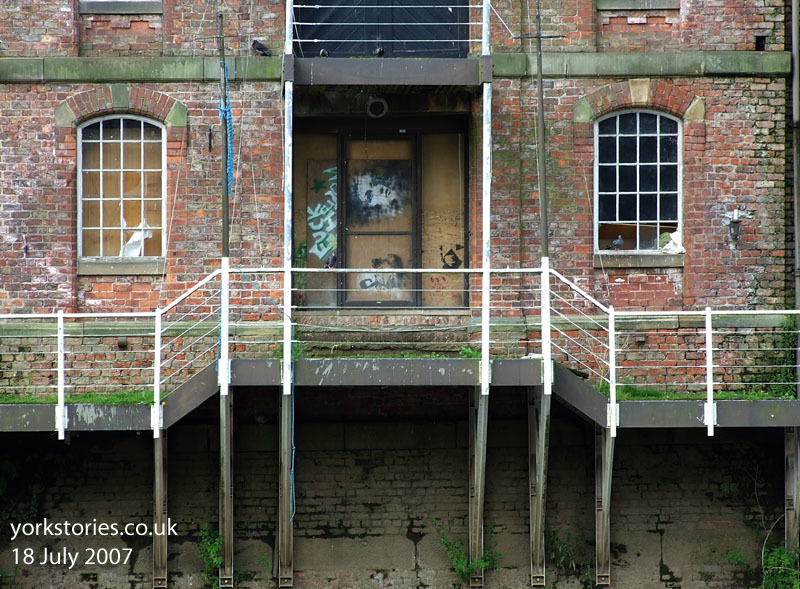 And around the other side, with flood waters reaching up to Skeldergate and the road along the front of the building, the one I walked along to take those photos in early 2004. 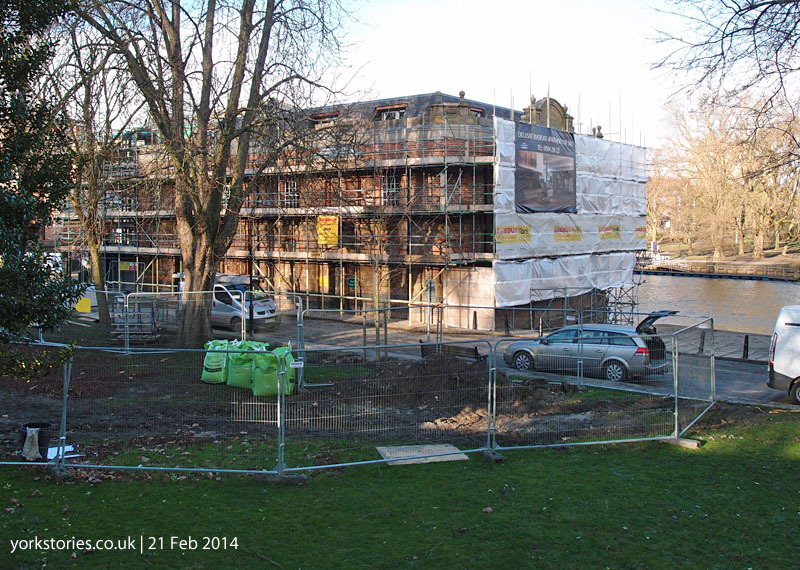 I took this from a temporary bridge put in place to help the residents of the flats next door access their property. And eventually, we get to the present time. The residents of this building apparently can’t make do with a temporary bridge but have to have a permanent bridge, which is being built across the small green area opposite. I don’t recall there being any opposition to this. After fourteen years I guess the council and other organisations were desperate to see the place rescued and brought back into use. The roof line has been altered (ruined, in my humble opinion) by cute little windows peeking up above where the roof used to be, where the pigeons gathered. Signs are hanging off the end advertising apartments only very few people could ever afford. In a different city, perhaps this place would have been kept by the local authority? In recognition of its value to the wider community? Anyway, it’s goodbye, Bonding Warehouse, as you’re turned into a shadow of your former self. Many of us remember this building when it was full of music and people laughing. More on that story soon. Reports from The Press in York during this period. See also the links on page 1 of ‘Recent history of the Bonding Warehouse’. It’s a shame when you think how imaginatively the space could have been used for the benefit of the wider community but I guess at least someone is lifting out of the murky waters. I loved the great comedy nights there with Jo Brand, Jeremy Hardy, Mark Thomas, Lee Evans, Lee Hurst, Hattie Hayridge, Ross Noble and many more. I can almost still feel the pain of trying not to go to the loo during a performance for fear of being humiliated by an eagle eyed comedian!